Beckton Sewage Treatment Works is the largest in Europe and is located in the borough of Newham, London. The works treats sewage from a population equivalent of 3.7 million within a catchment area of 300km2. The works have been the source of odour nuisance for many years, so in order to comply with the requirements of section 106 agreement of the Beckton STW Extension Project, and to meet a specific OFWAT AMP5 output to reduce odour nuisance from the works, Thames Water engaged the Joint Venture GBM to undertake a £63m project to upgrade the existing primary sedimentation tanks. 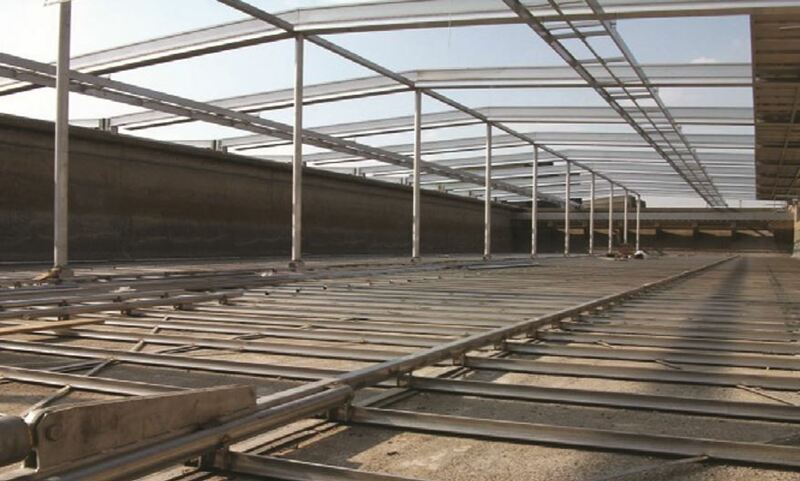 This upgrade, amongst other improvements, included the provision of odour containment covers to all 16 primary sedimentation tanks which had the ability to allow the scraper system running across the top of the tank to still function. Contracted to one of the world leaders in walk on aluminium covers, Temcor Conservatek, Satec Service ltd were chosen to deliver this package. The supporting structure of the odour control cover system comprised of aluminium support beams which spanned each half of the tank supported on the side concrete wall of the tank and the intermediate concrete T wall separating the two halves of the tank. Due to the length of this span, the beams required additional stainless-steel supporting columns in the centre raising up 6m from the tank floor. The aluminium support beams were spaced approximately 6m intervals down the 80m length of the tanks resulting in 13 bays. Formed aluminium cover panels 6m x 1m were then place one after another in between the beams filling the bays across the breadth of the tank. At eh end of each tank pitched end wall profiles were fixed sealing the ends. Sealing angles were affixed to each beam sealing the gap between cover panel and beam to complete the system. Smoke bombs were used to test the integrity of the seals. Installation of the stainless-steel structure. 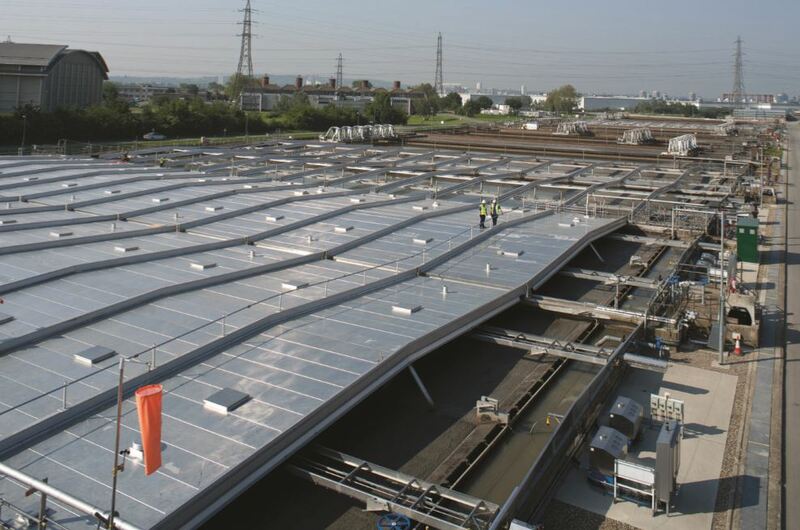 Installation of the 10,000 cover panels along with the 930 access/maintenance hatches and supporting structures.